Repeated Crash-rebooting on Windows 10 - what hardware is at fault? Brief overview About a couple weeks ago, my custom-desktop (built 2015) started hard crashing and auto-rebooting. The computer has crashed so many times at this point that I can barely keep track (like 50 times in 2 weeks). When I start it up in the morning, it works fine for a few hours, then it will suddenly crash, reboot, and then wait 5-10 min before crashing again and starts to enter the death-spiral of repeated crashes that become increasingly more frequent. Last time this happened (yesterday), it couldn't even get past the BIOS splash screen before another crash. Seems like a short circuit? I have tried a lot of troubleshooting steps so-far, and will list that out in detail below - but for those TL;DR, I am 98% sure it is hardware related, the question is, how to isolate what piece of hardware is at fault? How to test? motherboard or power supply or something else? I dis-enabled auto-reboot (per suggestions online), and then when machine crashed again, it automatically rebooted, which clearly seems to indicate that the problem is not triggered by Windows. I opened up machine and thoroughly cleaned it and checked pin connections between power supply and the motherboard. I re-seated these connections, and it seemed to stop the crashes for 5-6 days, but then it started happening again. I have tried tweaking the BIOS to disenable overclocking but I am thus far unsuccessful - I don't know why the ASUS Z170-A motherboard is so hard to throttle down, the 'EZ menu' doesn't provide an easy option to just shut it off, and in Advanced mode, even with most settings in the 'AI Tweaker' panel disenabled, it still overclocks. Still looking for a good guide out there that can show me how to do this. What can be overclocked, can be underclocked. 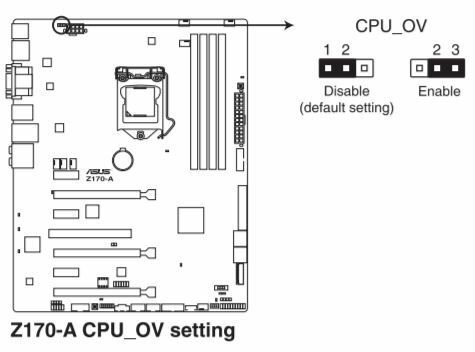 First, as per p. 1-20 of the manual, confirm jumper CPU_OV is Disabled which prevents overclocking. Retuning the memory as per page 1-36 can also help, but before you do that, please remove then reseat the RAM. Page 2-61 shows how to reset the BIOS settings to Optimized Default. Do it. Pages 2-7 through 2-10 deal with Fan Speed and Overclocking. Set the fan speeds to maximum, and then when the system is stable, start dialing fans back, in small increments, until you get your first hint of misbehavior, then speed up a little and lock in that setting. Set for Daily Computing in EZ Tuning, not Gaming; in general, anything which boots performance in the EZ Tuning section and other sections you don't want; stable (which you want) is slow. Not the answer you're looking for? Browse other questions tagged windows-10 cpu motherboard crash or ask your own question. Computer Freezing/Crashing While Gaming, I've Checked Everything, CPU or Motherboard? How do I diagnose a hard Linux crash? New Build: Various BSOD exactly 1:30 after boot every time, hardware? PC won't start when 8-pin CPU power is connected, what can I do? What is causing my Windows 10 computer to crash?